LG adds Spotify to 2013 Blu-ray players, cinema systems and more | What Hi-Fi? LG is bringing Spotify to a range of its 2013 Blu-ray players. home cinema systems and other internet connected devices. Spotify will launch on LG's Smart TV platform next month, on products including the flagship 9.1-channel LG BH9530TW cinema system. There was no mention of including Spotify on LG 2013 TVs, however. 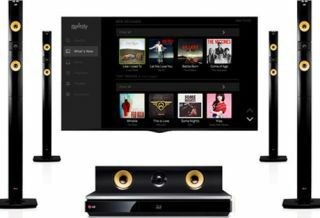 Spotify will join the likes of BBC iPlayer, Netflix, LoveFilm, YouTube, Facebook and Twitter on the LG Smart TV platform. You will need to be a Spotify Premium user to access Spotify on your LG device, as is the norm for other Spotify-enabled products such as Onkyo AV receivers, the Onkyo CR-N755 micro system and Denon CEOL Piccolo micro system. Spotify will be available starting in April on LG Smart Media devices in the United States, Europe, Australia and New Zealand.